You wouldn't necessarily think of smartphones and fried chicken as being intertwined, but that's exactly what is happening through a partnership between Huawei and KFC. The smartphone and fast-food company are joining forces to release a KFC-branded Huawei Enjoy 7 Plus. KFC unveiled the phone via its Weibo page. The smartphone will feature its usual array of impressive specs: 5.5-inch display, Snapdragon 425 processor, 3GB of RAM, 32GB of storage with expandability, fingerprint scanner and a 3,020mAh battery. But the reason you would really buy this phone for is its KFC branding. It sports a signature red color, similar to the one KFC uses in its restaurant scheme and even features a wallpaper displaying Colonel Sanders himself. KFC and Huawei are releasing the phone to commemorate KFC's 30th anniversary of doing business in China. This is plainly obvious with Colonel Sander's face etched into the back of the phone along with the year 1987. The phone is also coming with a KFC-branded music app that can be used to share playlists with KFC restaurants. 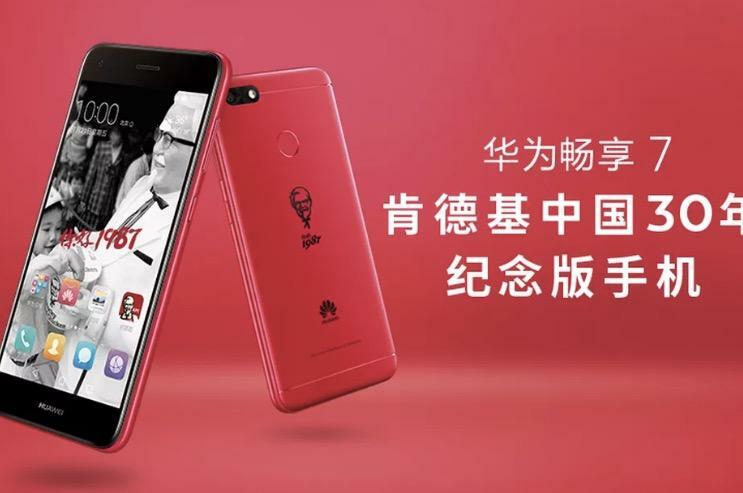 Huawei is only releasing 5,000 units of the KFC-themed smartphone, so better scoop one up before they are gone. The device will retail for 1,099 yuan ($162), a very competitive price. You can see more of the KFC-branded smartphone in the video down below.